This recipe is a little labor-intensive for a simple veggie side dish, but the outcome is worth the effort, I promise. When Boy and Girl tasted this, they actually said “Wow”, and they don’t even normally like zucchini. The squash takes on a nice, salty-sweet caramelized flavor, almost like roasted potates. It all started because I was bringing dinner last night to a sweet friend (who is undergoing chemotherapy) and her family. I made a marinated, grilled London Broil (*see note below) and some pesto rice and planned to steam some broccoli to go with it. Once at the store, however, I noticed that the broccoli did NOT look good (it’s not really broccoli season, after all), so I decided to switch gears and go with zucchini, instead (it looked really pretty AND it was on sale). I was worried, though, that the zucchini would turn to flavorless mush if cooked and reheated, so I decided to cut the slices thickly and give them a good browning to give them some flavor and texture. 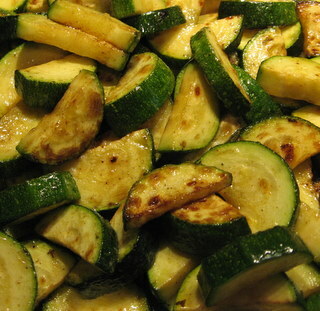 3) Add some zucchini slices (about one zucchini’s worth) to the pan, being careful not to overcrowd the pan. This is important; if there are too many in the pan, they will steam, rather than brown. 4) Sprinkle the topside of the slices with a little bit of Baby Bam. 6) Allow the slices to brown on the bottom side and remove them from the pan when they’re nicely browned on both sides, but still firm. If the slices are getting too soft, then your pan isn’t hot enough. If the butter is smoking or burning, your pan is too hot (the butter should turn a nice, nutty golden brown). * I also sent Gorgonzola mayonnaise (1/2 cup mayo, 3 Tbsp crumbled Gorgonzola, 1 tsp fresh lemon thyme leaves, blended well) to with the leftover beef to make sandwiches the next day. This particular family happens to also love my peppermint brownies (scroll down), so I sent some of those and some Blueberry Streusel Bars with Lemon-Cream Filling (which were AMAZING – see the next post for more info), as well. That is a nice picture of zucchini. I am making it tonight. I am also making your favorite pork tenderloin.